For all you pork lovers out there, here's a good one! I accidentally found this recipe online while I was searching for an interesting, but not too complicated, way of cooking pork shoulder. You see, I've never dealt with this cut before but when I saw it on sale at the supermarket for 99 cents a pound, I couldn't resist purchasing this gigantic and intimidating-looking meat. I just thought you can't go wrong with something that's bone-in and with a beautiful layer of fat on top. I knew it was going to be flavorful and moist. And did I mention that the skin that's left on this meat made me drool as it summoned images of freshly cooked 'chicharon' (fried pork skin) or 'lechon kawali' (crispy pan-fried roasted pork)? After taking this beauty home, I decided that I can cut a portion of it to use for other Filipino recipes like Batchoy Tagalog perhaps, and some more extra small pieces just for sauteing with some vegetables in the future. All this went back in the freezer. Money saved! Then I was still left with a huge chunk of the shoulder and decided to cook it the Jamie Oliver way. The ingredients are few and easy to find. The only two difficult things about this recipe are (1) the scouring of the skin and fat layers for salting, as you need an extremely sharp and pointed knife; and (2) the long wait since the recipe takes 6 hours to cook....yes, you read it right....6 long hours. I am telling you, though, it's worth the wait! By the fourth hour, your kitchen will really start filling up with the aroma of the pork. By the fifth hour, when you take it out of the oven to add the vegetables in the pan, you will be sorely tempted to just jump right in and start devouring it. The pork is practically ready at this point and it will be extremely tender that you will see parts of it beginning to shred. When I took it out of the oven last night with one more hour to go, I admit I made some modifications to the recipe. After roasting for 4 1/2 hours and spooning all of the fat out of the roasting pan (and saved it, of course! ), I placed the pork back in the pan and broiled it on high for about 3 to 5 minutes. I did this to make the skin more brown and crispy. After this, the skin will look irresistible but be strong and try to look away. Look away AND walk away to grab your vegetables and all the fat / drippings that you set aside. Lift the pork shoulder out of the pan again and do this carefully as it may shred and break into pieces. Place all the vegetables on the bottom of the pan and pour in all the fat. I saw no need to save any liquids for the gravy since I wasn't intending on making it. I felt the drippings and the vegetables were going to be fabulous enough to eat with rice, the Filipino way! That's just me. You can of course follow the recipe to a "T". Finally, I let the pork sit on top of everything and placed the pan back in the oven for another hour, uncovered. After one more hour in the oven with the vegetables, I promise it will be heavenly. When mine got done last night, the pork was so tender it was melting in my mouth. The garlic cloves that roasted with their skins on became buttery and sweet. There was just a hint of flavor from the laurel leaves that added an interesting depth of flavor to the dish. 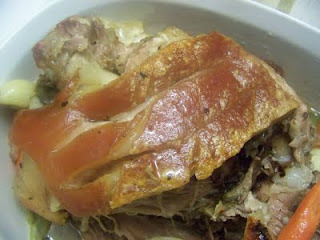 The saltiness of the pork mostly rested on the crunchy top layer while the meaty parts just had a mellow flavor to them. Well, enough said. Here's the link to the recipe and I hope you enjoy it as much as our family did! I've gotten so hungry just describing it that I think I need to have more of it now. Wow,Joy! You can make a living writing recipe books with a twist...you make me want to eat pork even if I'm not really a foodie. Keep cooking and writing about it and hopefully sometime..somewhere.. in a not too distant future we can all seat down to a feast of your creation.... I love tracking your transformation from the Joy I used to know. You've made all the right choices. That looks so good! You're making me hungry! i'm drooling already! 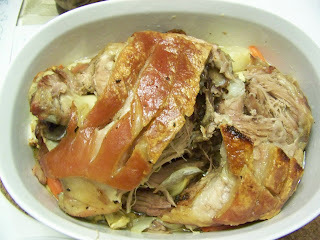 i was thinking of lechon kawali this morning and then your blogpost! it's a sign. looks really yummy! pa-order na lang...no time to cook e! Oh, my! I just popped a button looking at this! Yum!